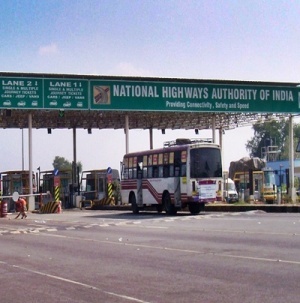 As many as 350 toll plazas on national highways across the country will adopt the electronic tax collection method from December 31, resulting in savings worth Rs 34,000 crore (Rs 340 billion), Union Minister of Road Transport and Highways Nitin Gadkari said on Friday. "By December 2015 we plan 350 Electronic Toll Collection at all national highways across India which will help in savings of Rs 27,000 crore (Rs 270 billion) due to delays caused at tolls and Rs 7,000 crore (Rs 70 billion) worth of fuel will be saved," the minister said while unveiling the ETC system on Delhi-Mumbai highway through computerised mode from Delhi. On the Delhi-Mumbai highway, Rs 1,200 crore (Rs 12 billion) worth of fuel will be saved annually after the installation of ETC, the minister said. ETC has been installed at 55 Toll Plazas and their integration with Central Clearing House operators has almost been completed on the Delhi-Mumbai route via Haryana, Rajasthan, Madhya Pradesh, Gujarat and Maharashtra. A pilot project for interoperable ETC system of 10 toll plazas between Mumbai (Charoti) and Ahmedabad has already been tested and seamless ETC on this section is in operation. The central government has issued orders to incorporate ETC lanes as a mandatory clause in the contracts awarded for all highways projects in future. At present, there are some problems in collecting toll, including lack of uniform rates, throughout various sections of the national highways and many complaints of overcharging and undercharging. For implementing ETC across the country, a new company under Company's Act, 1956, with equity participation from National Highways Authority of India (25 per cent), concessionaires (50 per cent) and financial institutions (25 per cent) has already been constituted. The name of the new company is ‘Indian Highways Management Company Limited’. The company's objectives include collection of toll through ETC and manage the project and commercially provide services of central ETC system. Necessary amendments have already been made in the Central Motor Vehicle Rules, 1989 for fitment of Radio Frequency Identification tag on vehicles for ETC.